With lots of zucchini in the fridge, it's tempting to pull out a zucchini quick bread recipe. 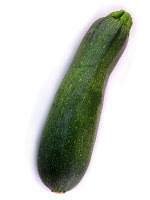 But it occurred to me that zucchini probably works in yeast breads, too, and I was in the mood for a sandwich. I searched on Google and found a bunch of zucchini yeast bread recipes. The one below seemed perfect since it would use up most of my zucchini, and only had 5 ingredients. It turned out great. Brushing olive oil on top just before baking gave the bread a nice crust and the texture of the crumb was really chewy. I even admired the cross section, with flecks of green from the unpeeled zucchini. My ideal sandwich for this bread would be swiss cheese, a tiny bit of mustard, and some sprouts. If not that, simply butter would do. 1. In a colander, alternate layers of grated zucchini and salt. Leave for 30 mins over a bowl or sink. Then squeeze out the moisture with your hands. 2. Combine the yeast with 1/4 cup of lukewarm water, stir, and leave to dissolve for 15 minutes. 3. Place the zucchini, yeast, and flour in a bowl. Stir together, and add just enough of the remaining water to obtain a rough dough. 4. Transfer to a floured surface and knead until smooth and elastic. Return the dough to the bowl, cover with a plastic bag, and leave to rise in a warm place until doubled in size, about 1 1/2 hrs. 6. Preheat oven to 425 degrees F. Brush with olive oil and bake until golden, 40 to 45 minutes. Cool on a wire rack. That loaf is Gorgeous! You've reminded me that I have a brand new loaf pan in the cupboard that I haven't used yet. I'm going to look for zucchini at the farmer's market next Saturday and give this recipe a go. A perfect loaf of Zucchini bread you have there!!! tmc - awesome. great way to inaugurate your new pan.